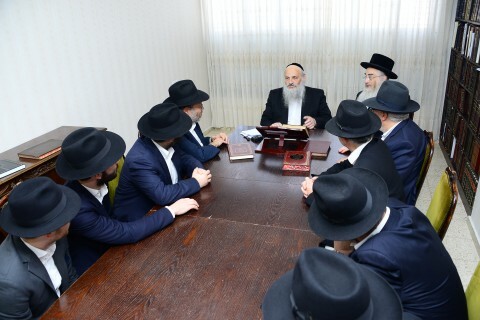 For the last 6 years, Sar Hatorah and Rash’k’baha”g, Maran Hagaon Harav Chaim Kanievsky, shlit”a, has given the avreichim hageonim of Shas Yiden an annual farher of the entire Shas. On each occasion, they all excelled. 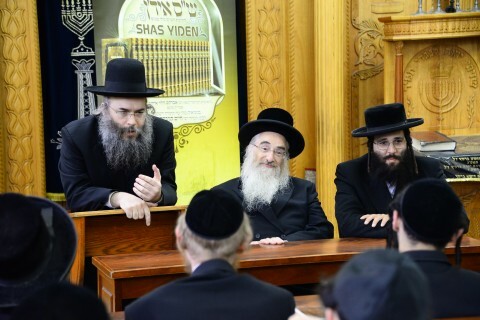 Rav Chaim, who is a passionate promoter of studying and mastering the entire Shas, expressed his joy and satisfaction at their prowess and encyclopedic knowledge. 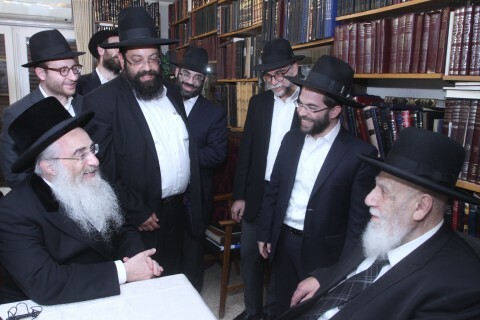 Two weeks ago, in a gathering at his home with the hanhallah of Shas Yiden, his sons hageonim shlit”a, the avreichim hageonim and supporters of Shas Yiden from America, Rav Chaim accepted to serve as the Nasi of the Reshet Hakollelim – Shas Yiden (the Shas Yiden Network in Eretz Yisroel). When Rav Chaim finished giving them the Shas farher, he gave a brocha for the opening of Shas Yiden-Yerushalayim, made a heartfelt l’chaim and then signed a note expressing his appreciation of Shas Yiden. All present then burst into song. And I bless them that they should merit to increase the greatness of Torah, and to glorify it, through nachas and expansion of knowledge, with brocha and hatzlocha in all that they do — Amen, and may it be His will. 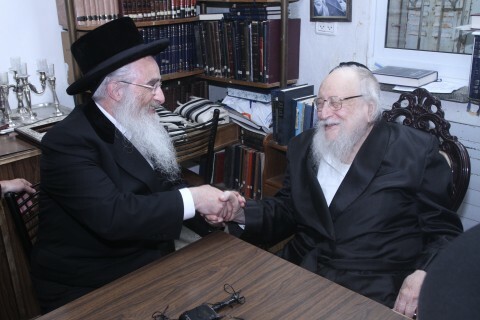 Rav Chaim has taken an avid interest in the progress and development of Shas Yiden. 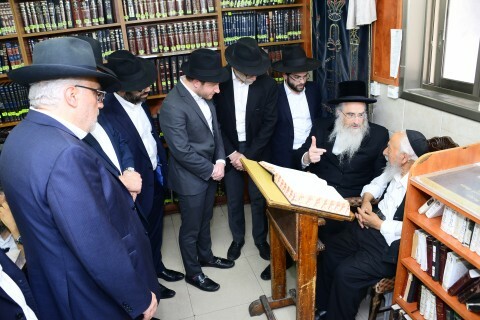 It was at the annual farher in November 2016, that he made a personal request of the Shas Yiden Founder, Hagaon Harav Avrohom Eisen, the Pozna Rov, shlit”a, to open a second kollel branch in Bnei Brak that would follow the same Shas Yiden regimen of pansophic Talmudic excellence. 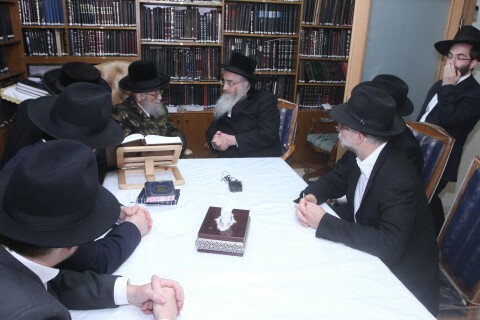 Rav Eisen, together with the Rosh Hakollelim, Hagaon Harav Moshe Isaac Samet, shlit”a, set about identifying, interviewing and testing applicants. While there were many hopefuls, there were very few who would be able to keep up with the demanding pace and the 8 daf-a-day regimen of the Shas Yiden program. In just 7 months, 10 avreichim geonim were identified and accepted. 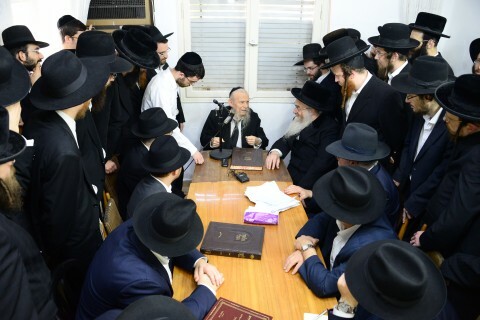 Thus, on Rosh Chodesh Iyar last year, Shas Yiden-Bnei Brak was inaugurated in the home of Rav Chaim. 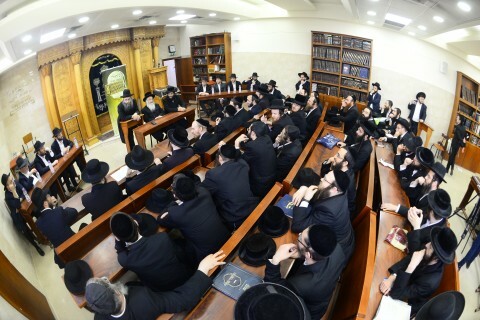 This latest gathering of the avreichim geonim at Rav Chaim was the third in the space of a year. The occasion was Rav Chaim presiding over the inauguration of Shas Yiden-Yerushalayim as per his enthusiastic brocha just seven months ago. As has been his custom, Rav Chaim gave them a farher on Shas! Rav Eisen called out the name of a maseches, Rav Chaim responded with a question, and the avreichim responded with the answers. It was amazing. This time the complement of the avreichim geonim – 21 in Bet Shemesh and 11 in Bnei Brak – increased by 10 – the new avreichim geonim from Yerushalayim. The minimum requirement for each avreich is to complete the 2711 daf of Shas five times, which equals 13,555 daf per year! Multiplied by 42 avreichim, this equals 569,310 daf in the course of this year! Since Chanukah, Rav Samet has kept an eye open for outstanding talmidei chachomim in Yerushalayim to echo the tremendous achievements of the avreichim geonim in Bnei Brak and Bet Shemesh. There were many applicants, and after interviewing and testing them all, a minyan of metzuyonim were accepted. But then, a suitable location was needed. Well, there is now a new landmark. Next door to the famous Manny’s bookstore, emblazoned for all to see is the large blue sign – Reshet Hakollelim – Shas Yiden, Yerushalayim. In less than two weeks of its existence, it has become a talking point throughout the city – the all-encompassing greatness of the Torah is being restored in the Holy City. For many a yungerman who wishes to continue learning after his marriage, an ideal arrangement is for the shver (father in law) to set him up as a Rosh Kollel. Thus, he will have the opportunity to grow and shteig in his learning. So it was in Yerushalayim with Reb ‘Avrohom Cohen’ (name changed to protect privacy). For some five years, he has led a successful kollel in Yerushalayim. Over those years he has closely followed the unfolding story and success of the Shas Yiden project. He dreamed of being part of the Shas Yiden group if it would ever open in Yerushalayim. One of the avreichim who signed up for Shas Yiden-Yerushalayim, developed ‘cold feet’ at the last moment. He was beset with doubts: Could he keep up the pace? The incredible daily demands would have an effect on his wife and children as well. Every day would impact on his being a father – the learning would have to take first place. 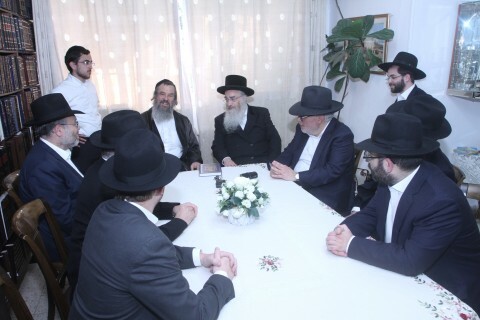 Maran Sar Hatorah asked his chavrusa, Harav Hagaon Eliyohu Mann, to deliver messages on his behalf, to both the avreichim and to the dozen supporters of Shas Yiden who had flown in to Eretz Yisroel for the special occasion. To the avreichim the message emphasized the vital and supreme importance of learning Torah. The message was interrupted a few times by Rav Chaim, plying the avreichim with questions from Shas. Rav Mann then expressed Rav Chaim’s appreciation of the Pozna Rov for what had already been achieved by the Shas Yiden kollelim. To the supporters, Rav Mann mentioned that they would be blessed measure for measure – just as they assisted for kol Hatorah (all of the Torah) to be learned, that you will be blessed with all the blessings: Blessed is the one who supports (yakim) this Torah – both materially and spiritually. The gathering was addressed by Hagaon Harav Chaim Feinstein, Rosh Yeshiva of Ateret Shlomo. Rav Mann turned to Rav Chaim and asked, “What will those who support Shas Yiden merit?” Rav Chaim’s two-word answer stunned everyone present – “l’yemos Hamashiach (the Days of Mashiach)!” Amid the consternation, Rav Man asked, “But before the days of Mashiach come the chevlei (travails of) Mashiach. Will the supporters of Shas Yiden be saved from them?” Rav Chaim responded: “Both spiritually and materially – behakol (in everything).” Rav Chaim then added that the wives of the Shas Yiden supporters will receive half of these rewards! Hagaon Harav Chaim Feinstein, Rosh Yeshiva Ateret Shlomo, was asked to address the gathering and was overflowing in his praise of Shas Yiden. When he concluded his words, Rav Chaim exclaimed “It is time to drink a l’chaim”. Immediately after these brochos, the Sar Hatorah took leave of the avreichim, Rav Eisen and the supporters. The members of the Rav’s household all declared that there had never been a similar gathering in the home of Rav Chaim. In the afternoon preceding the Shas Yiden-Yerushalayim gathering, all the avreichim geonim gathered in the Shas Yiden-Bnei Brak bais medrash for a full-blown farher on the entire Shas. The visitors from the United States would have the opportunity to see ‘total Torah in action’. For over an hour they witnessed total focus and the ebb and flow of Torah knowledge from every corner of Shas. Another highlight of the new zman and the new Shas Yiden-Yerushalayim, was the address by Maran Hagaon Harav Gershon Edelstein, Rosh Hayeshiva of Ponevez. At a special gathering at his home for the avreichim and the visitors, Rav Gershon spoke most inspiringly about the concept of limud Hatorah. His words dramatically brought home the beauty and fulfillment of Torah that can eclipse even the physical hardships that may face one on his quest to plumb the depths and master the expanse of Torah. “Not only will you be enveloped in holiness, but contented and happy you will be in this world, and it shall be good for you in the World to Come. Rav Edelstein then addressed the Shas Yiden supporters, highlighting for them the benefits to them in Olam Habah that would result from their Yissachar-Zevulun pacts with the avreichim hageonim. He highlighted his words with a story of one who had passed on and had sponsored the learning of Gittin. He appeared in a dream in which he recited the entire Rashba on Gittin – something that he had never learned in his life! 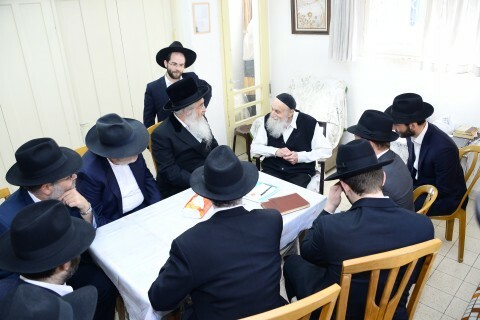 The group of Shas Yiden supporters were taken for private visits with Marannan Hagedolim Harav Berel Povarski, Rosh Yeshiva of Ponevez, Harav Dov Landau of Slabodka and Harav Shimon Baadani in their homes. Meeting with the mashpia hagadol Harav Elimelech Biederman was an uplifting experience leading up to the gathering at Rav Chaim. All the gedolim were effusive about Shas Yiden and encouraged the visitors to continue their support, and spoke about the brochos with which they would be blessed. 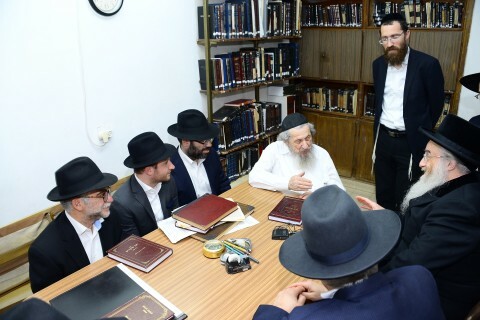 In Yerushalayim, the group met with Hagaonim Roshei Hayeshiva: Harav David Cohen of Chevron, Harav Yaakov Hillel of Ahavat Shalom, Harav Yitzchok Sheiner of Kaminetz, Harav Shalom Cohen of Porat Yosef, Harav Chaim Hacohen Kook of Toras Refoel and Harav Tuvia Weiss, the Yerushalayimer Rov. 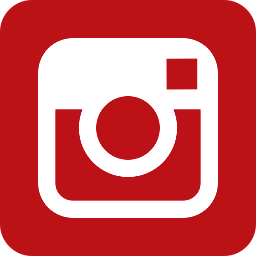 Recordings and videos of the gathering at Rav Chaim and the farher will soon be uploaded to the Shas Yiden website – www.shasyiden.com – shortly after Shavuos. For further information on Shas Yiden or to donate, call 718-702-1528 or go to the website and click on the Donate tab.